Grasshoppers have been of economic importance in Florida. A few species may occur in large enough numbers to cause serious damage to citrus, vegetable crops and landscape ornamentals. One of the species most commonly causing damage is the eastern lubber grasshopper. The Eastern Lubber is surely the most distinctive grasshopper species. 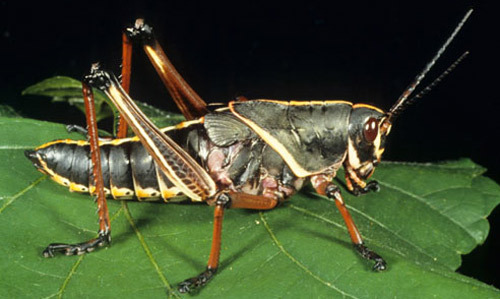 The immature Eastern Lubber Grasshopper differs dramatically in appearance from the adults. The adult is a brilliant yellow with red and black markings and is incapable of flight. The nymphs are almost solid black with yellow, and occasionally red, markings. This species is incapable of flight and can jump only short distances. The Eastern Lubbers is quite clumsy and slow in movement and mostly travels by walking and crawling. They have one generation per year, with eggs beginning to hatch in February in South Florida while the rest of the state usually doesn’t see this species until March or later. These grasshoppers will migrate long distances to obtain preferred food, sometimes forming trails and following one another. Eastern Lubber Grasshoppers seem to prefer open pine-woods, weedy fields and the weedy vegetation along roadsides. The accumulation of weedy plant species along drainage ditches within citrus groves and vegetable fields will sometimes attract lubbers, then later migrate to homes, yards, and crops. The crop most often affected in Florida is citrus, though typically it is mostly the small, newly planted trees that are adversely affected. Adults of Eastern Lubber Grasshoppers possess a variety of abilities to defend themselves. If the red, yellow, and black coloration fails to keep a predator at bay, when contacted the lubber may produce a phenolic secretion from a special thoracic gland, first as a dispersant spray and then as a frothy secretion. Grasshopper abundance can be regulated through management of the vegetation. If you deprive grasshoppers of their favored food, often they will leave or perish. If you cannot control them through hand-picking, insecticides can be applied. 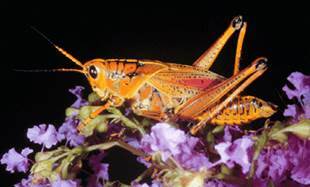 Insecticide-containing baits are often used for grasshopper control. Bran bait containing corn oil and insecticide is attractive to lubbers, and they will perish after eating only a small amount of the bait. If you live in Naples, Bonita Springs, Fort Myers, or anywhere in Southwest Florida and are over run with these Eastern Lubber Grasshoppers and need help. Call 239-455-4300 Collier Pest Control for a full explanation on how we can help you with these Grasshoppers or look us up on our website at collierpestcontrol.com. Remember Florida does not have to be shared with insects.